I kind of don’t know how to deal with the casual racism in these books. The minstrel show in the chapter “The Madcap Days” appals me as an adult. As a child, living in Jamaica, sharing homes with Jamaican families and running in a pack with Jamaican kids, I actually didn’t know what the “darkies” of this chapter were supposed to be. Clearly they were men making music and singing, their faces disguised with black polish. I neither knew nor would have understood what they were supposed to be. They might as well have been Morris dancers or chimney sweeps. I don’t think this excuses what’s going on here, but I do think it shows that A) what you read doesn’t necessarily damage you for life, and B) children are very good at blocking out the things they don’t get. I wish it wasn't like this: but the book was published in 1941 and is set in 1882, so we're stuck with it. This is also where I first read the Declaration of Independence. She quotes an awful lot of it. 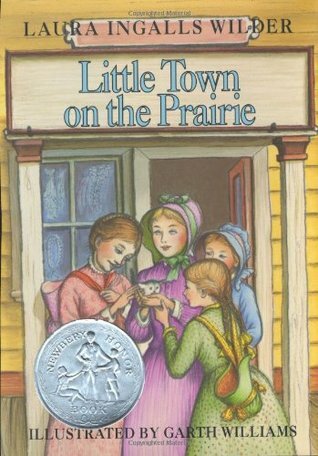 Sign into Goodreads to see if any of your friends have read Little Town on the Prairie. This was always my favourite, too. I had no clue until I was in my 20s what "blackface" comedy was. :-/ I do remember that that chapter was the first I ever heard from the series read aloud by a friend's mom, so it made an impression. My main memory of that episode is the girls' and Ma's fear that Pa had shaved his beard! Yes, I remember being "what is the big deal with the beard???" I was... 7 maybe? I'm reading the whole series with my 9 year old thought now, and finding that while it makes me squirm sometimes, it also allows for some good conversations about attitudes, ideas and tolerance. We talk a lot about what is different now. It's interesting to me as an adult to realize how intolerant and rigid Ma was, I always remembered her as sweet and calm. I didn't know about the darkies either! But I'm going to give her a pass since I basically learned to write from reading her books, and they fueled my love of history. I think it is very dangerous to shun people for being misguided, or for being products of their time. There is always room for conversation. She is a fabulous writer who's left the world a lasting, if flawed, legacy, and her books shaped me for the better. Reading them with a clearer understanding of them can only do me good!